Angle Elite Collection Tucson leather dog collar is Buck Stitched, Hand Carved, Hand Dyed Leather Dog Collar. It is a soft and supple hand carved and hand dyed richly made dog collar. Beautiful hand carvings adorn the two tone brown collar and the edges are finished with contrasting buck stitching. We start with 100% genuine padded argentine cowhide leather and add a center D-ring for maximum control and exposure. Center D-Ring keeps the leash & buckle at the back of the neck in the most comfortable position. Hardware is stainless steel so it won't rust. 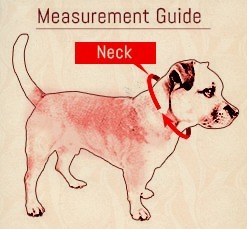 *Please note this size chart is meant to give a general idea of the collar size in relation to certain breeds; Because each dog is unique, please measure your dog’s neck for perfect fit. 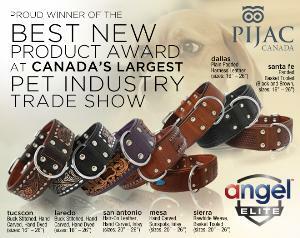 Our Angel Elite Collection won Best New Product Award at Canada's Largest Pet Industry Trade Show. Available in brown with contrasting buck stitching; 6 sizes: 16" to 26"
There is a 10% restocking fee for returns other than manufacturers defect. Please measure your dog carefully.